Clarke Carlisle's wife has thanked Burnley for planning a minute's applause for her husband during the Boxing Day game against Liverpool. Former Clarets defender Clarke, 35, is in hospital after being hit by a lorry on Monday. 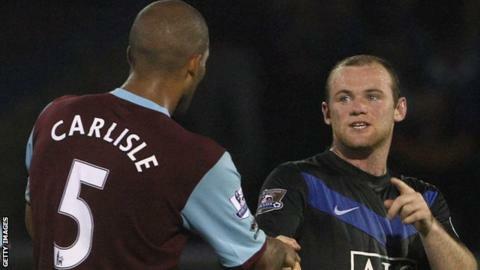 As a sign of support for their former player, Burnley said fans would clap in the fifth minute of Friday's game. "Clarke and I will always have Burnley in our hearts," Gemma Carlisle wrote on Twitter. She also thanked a number of Carlisle's other clubs, including Blackpool, QPR, Watford, Leeds, and Northampton for their messages of support. "Thank you each and everyone of you," she added. "I'm trying to read all messages. #blackpoolfc #qpr #watfordfc #lufc #bufc #ntfc"
Clarke wore the number five shirt during his career at Burnley, where he made more than 130 appearances. He suffered serious, but not life-threatening, injuries during Monday's accident, which occurred on the A64 near York. Carlisle, a former chairman of the Professional Footballers' Association, regularly appears on television as a commentator and pundit. He has also been a contestant on the long-running Channel 4 quiz show Countdown and a guest on the BBC's Question Time.